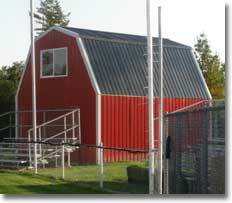 When you mention barn designs, the first thing people think of is the gambrel building. Like the barns of olden days, they are large, roomy and great looking functional buildings that no longer are just for horses or livestock any more. When you decide you are going to design your own house, one of the top choices for an upscale one of a kind house is a gambrel roof. Yes, it’s a barn design. It’s just one of many wood, vinyl or steel residential building styles which have much to offer in the way of roominess and varied building use. Before you say no, view some of the attractive barn photos. One of the first years after Hansen Buildings started its internet custom designed building kit business, a lady called to lament over her husband wanting to build a “barn house”. She was frantic, looking for reasons to tell her husband a barn design was going to be too expensive, too plain, or any excuse she could find to change his mind. When we sent her photos of the interiors of gambrel roof style “barns”, including kitchens, bathrooms, beautiful wood trimmed high arched ceilings, she began to change her mind. Her next concern being whether or not a steel residential building would “fit in” with the other houses in her neighborhood? Metal building designs of the past were commercial in looks, so a steel covered barn design was the furthest thing from her mind. Take a look at one of the largest, and most beautiful of the barn designs that have been used over and over in various sizes and variations over the years. This gambrel building has a main area of 48’ x 60’ with 18’ width sheds, one of which is set back for a welcoming entry area and small courtyard. One of the sheds is home to two roomy office spaces and storage. 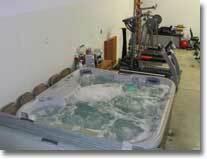 The center portion has a large hot tub, exercise area and room for 4 vehicles with an indoor wash station. The longer lean-to shed houses a boat, pickup, two hunting/fishing storage closets and six person sauna. This “man’s cave” is complete with a small kitchenette and a full bathroom with shower. The really fun part of this gambrel building is the upstairs, with a whole wall of various custom designed windows. Full living space occupies the upstairs, complete with a large fireplace, massive master bedroom with third story sewing room loft above. The huge open kitchen and family room with pool table and big screen tv top it off. Although there is a full set of stairs, getting groceries up to the “home area” is less of a problem with the two person pneumatic tube elevator. Storage is endless in this barn design, with full closets running the 60’ length above the two wing sections. 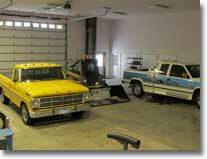 Because the upper and lower areas are clearspan, room size variations are limitless in this “barn designed” building. 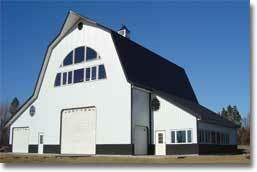 What will your barn design cost? Pick the square footage you need and get a free quote!